Your Blog Needs Great Content? We’ll write it for you! We offer professional blog and research paper writing service for business owners and private clients. We will fill your blog with great content that is always original, keyword-targeted and customized for your business, your industry and your target audience. You can finally free your time, while your blog will be updated as usual! Even if you are away for a vacation or a long-term business trip, we’ll keep posting fresh and timely content for your blog on the regular basis. Enjoy proven quality and flexible price structure. Your satisfaction is our utmost priority. We offer you the best combinations of value and quality along with prompt and reliable customer service. To check the quality of blog articles we provide, you can read our own blog. If you still doubt – try our service risk-free by placing your order for one single post! You can test drive our service and if you are not completely satisfied for any reason – you won’t be left holding the bag. We will return your money back, so you have nothing to loose! Order More – Pay Less! 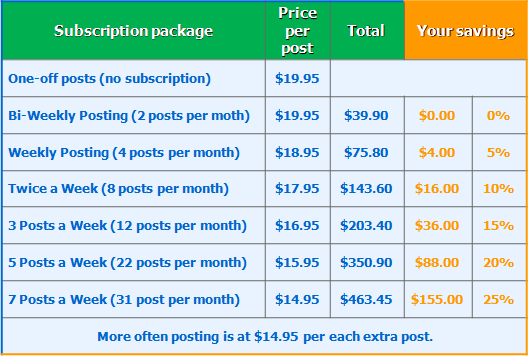 Our customers enjoy even bigger savings, when ordering more than 4 blog articles at once. Take a look at our blog writing packages and choose the option that suits you best! Each blog post is a 500-600 words article with original title, optimized for 1 keyword provided by customer. Images can be added for additional fee of $4.00 per piece.